All one has to do is enter the domain name, click Search – and the registry information is displayed. But what database is running in the background allowing such queries? The database is the so called WHOIS database and it has one distinct property: it provides us with a query interface via TCP port 43! And as the .NET framework provides us with the TcpClient class, we can use this interface to directly obtain our data without the extra effort of scraping the web pages at Network Solutions. To be able to work with the TcpClient class, we need the System.Net.Sockets namespace. Furtheron, we need old acquaintances like System.Text or System.IO. Most of the work in this example is being done by the TcpClient class: using it, I can connect to a server on any port (the Connect method does that) and send data to and fro (via Stream). Sending the query warrants a little explanation: for sending I use the binary stream without any wrappers. Therefore, I have to turn the query string (CR/LF terminated) into a byte array (with ASCII encoding) and can then send the desired number of bytes to the server. Fetching the data happens via the StreamReader, which allows comfortable and direct work with the character data. And to keep the example simple to the end, the received data are immediately passed through to the client – the result can be seen in the following screen shot. 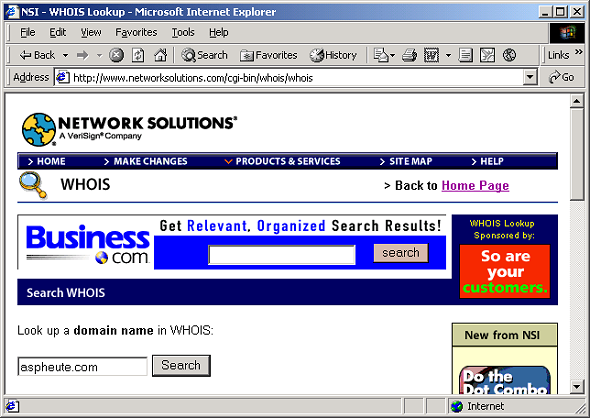 Now we know how to query the WHOIS server of Network Solutions. Have we achieved something with that? Certainly – (almost) every registry has such a server and the procedure is always the same. You just need a list of registries and their WHOIS servers. Precisely that is what I implemented in the following example: it contains a simple form for entering the domain name. ASP.NET on the server side checks the validity of the domain name and then decides according to the domain suffix (.com, .de etc.) which WHOIS server of which registry is to be queried for information about this domain. The code already has more than 100 lines, so that I split the explanation. If you want to keep the “big picture” before you, open the code in the file queryregistries.aspx in a second window. There is not much to say about the form being used. There is an input field, a button and a label control into which the result is output. The uppermost block concerns itself only with checking the validity of the input (perhaps you should print out the error messages after all). Then I set up a hash table linking the TLDs with the respective WHOIS servers. I only picked the most important TLDs, but this is enough to query all US and European domains. After the creation of the Hashtable the code decides which server to use. By default it is the one of Network Solutions, in other cases a special one or the RIPE server in case of 2 letter TLDs. In any case the hash table should be completed if querying of South American and Asian TLDs is wanted. As we now know what we want to look up, and especially where to query, we can let the function DoWhoisLookup do the work – and then simply output its results. Now we are looking at the real work horse of the application. This function performs the query and the Good News is that we indeed could reuse all the code of the Network Solutions query – I just added some exception handling to make the application really robust. As already announced, exception handling was added. Furthermore, I now use the StringBuilder class as I have to pass the response of the WHOIS server on to the caller instead of directly to the client. And that already was the whole magic! 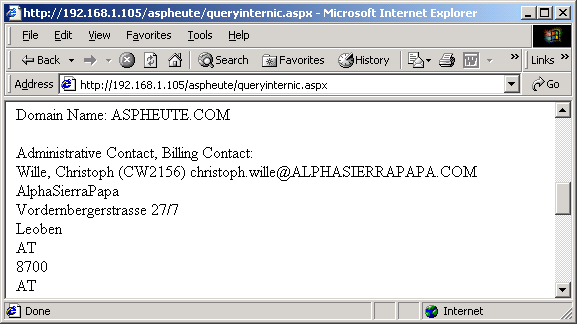 Thanks to the .NET Framework classes we were able to build a comfortable cross-registry WHOIS query form. The only blemish is easy to remove: the hash table ought to have the remaining international WHOIS servers added, but from the European’s point of view the most important registries already can be queried!